March 5, 1977. 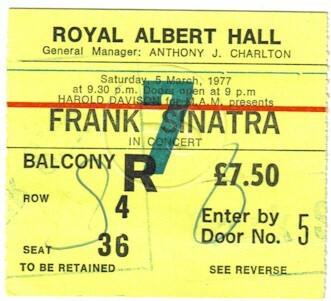 Acquired from the Original Recipient who obtained this IN-PERSON at Frank Sinatra's 1977 convert at Royal Albert Hall. Beautiful dark pen signature on the back of the Original Royal Albert Hall Ticket. Signature is consistent with his authentic examples from that time period. 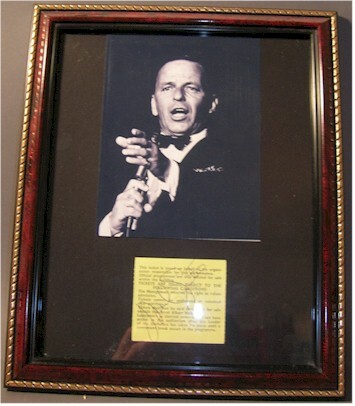 Our company stamp is only on the image to discourage the online forgers who often reverence our site to produce forgeries from our Authentic examples. .
Nicely framed (8x10" frame) with an original photo from that evening in 1977. 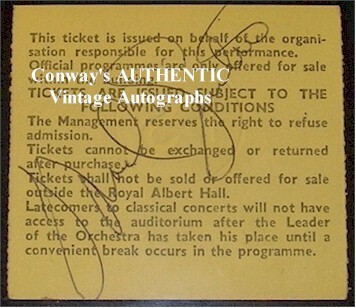 BEWARE of Ebay Autographs - and as always GUARANTEED FOR LIFE!